There is always an air of excitement around the warehouse whenever there are new product launches, and this is especially the case whenever one of our largest suppliers LED Autolamps announces a new release. We have been a distributor for LED Autolamps for the past three years and we have always been impressed with their competitive pricing, large product range and the fact that they carry large stock which always enables us to ensure fast delivery for our customers. 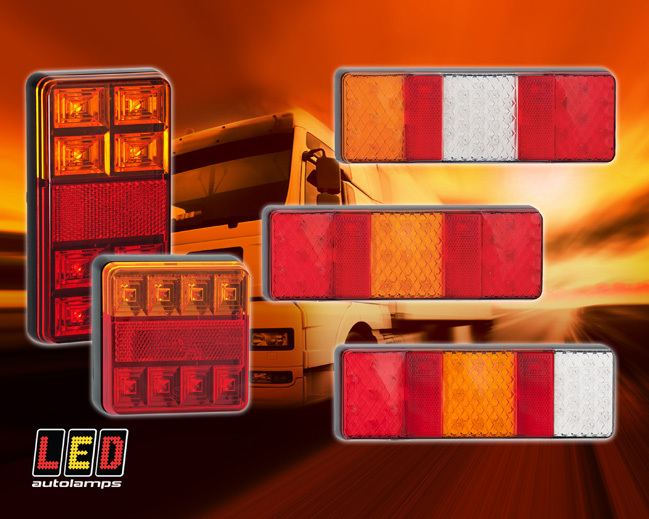 During the summer LED Autolamps introduced three new series of Combination Lamps – 250, 151 and 101 series to further complement its existing ranges of Combination Lamps. These 250 series lamps have sealed electronics, are fully submersible, rustproof and shock-resistant while featuring LED Autolamps’ highly-effective diamond lens pattern, which has proven so popular with their other series. The circuit board is fully encased in resin with corrosion-protected tinned copper wiring and comes with a 5-year warranty. This new introduction to the range currently comprises three models – 250ARWM, 250WARM which incorporates Stop/Tail, Indicator, Reverse and Reflector, while model 250FARM incorporates Stop/Tail, Indicator, Fog and Reflector. The units are fitted with a 40cm hardwired cable, provide multi-volt operation of 12-24 volts and offer the benefit of extremely low power consumption with a current draw at 13.8 Volts of 0.04 Amps for Stop, 0.32 Amps for Tail, 0.32 Amps for Indicator, 0.24 Amps for Reverse and 0.15 Amps for Fog. The 151 and 101 series have sealed electronics, 3-year warranties, 12-volt inputs and stop/tail/ indicator and reflector functions.